Do you want the most features? the best reading experience? Comic Zeal 9 has them both. 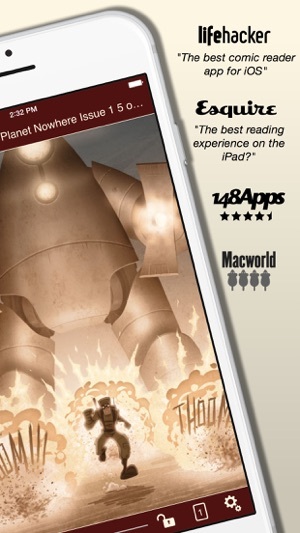 It was the first comic reader in the App Store, it’s still the best. • Organize your collection how YOU want. Put series inside series, use dividers to manage long lists. 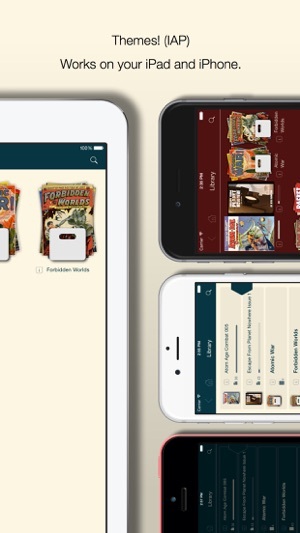 • Automatically sorts comics into their series. • Super fast reading view with two-page mode and assisted panning. • Page position lock so you don’t see the same borders page after page. • Does the right thing when you rotate your device, many comics have a mixture of portrait and landscape pages. 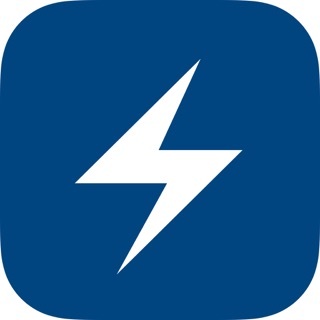 • Lightning fast search, by comic title and tags. • Parental lock for individual series. 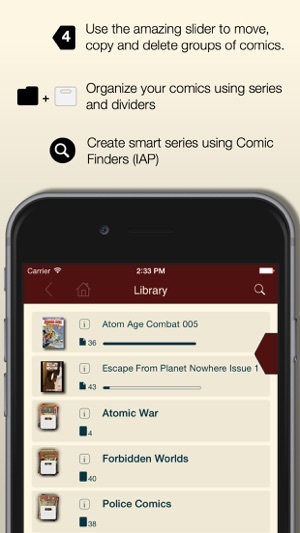 • Comic Finders, create smart series that show you unread comics from all over your library. • Seven new, gorgeous themes. • WI-Fi using a web browser on a PC or Mac. • Drop Box, iCloud Drive, etc using iOS document sharing. • AirDrop from a Mac. Comic Zeal features the innovative slider, it's a pointer, a container and a toolbox, all in one. You can push stuff into it, then go anywhere in your collection and drag it out. It's an incredibly fast way to organize your comics. 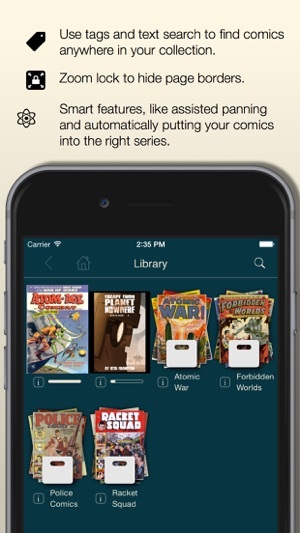 • Reorder comics, put them into the slider in the order you want them, then drag them out. • Create series and dividers right in the app. Dividers are lists that can hold comics, series and even other dividers. 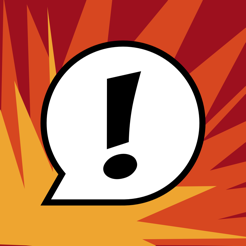 • Tap the ‘i’ info icon for comics, series and dividers. You can rename entries, sort a series or mark items as read or unread. • When zooming, hold the gesture for half a second. Comic Zeal will lock that zoom and position when you turn the page, it's a great way to hide borders. Please note, there is a problem with Google Drive’s iOS extension that doesn’t allow you to open comic and other files that they consider to be ’non-standard’. You can read more about it here: https://goo.gl/EKVRbN and here https://goo.gl/XXYRQI . You can open Comics from the Google Drive app itself using the 'Open in ...' option, just not directly from Comic Zeal. - Imports now happen completely in the background. - Fixed a couple of crashing bugs. Comics are imported super quick now, can you let me know if you need some kind of download queue display? @bitolithic on twitter. Добрый вечер. Купил эту читалку специально для комиксов в надежде, что получу качественный сервис, а вышло наоборот. Комиксы закидываются в хаотичном порядке, просто папку с комиксами скинуть нельзя, читалка не увидит. Строго по комиксу. Не сортирует, то есть если закинули случайно конец, а потом начало, то только в ручную или заново. Читалка банально не понимает, что больше 00/01/02 и так далее. Крайне разочарован. Не покупайте!